Conserve Wildlife Foundation is excited to celebrate Amphibian Awareness Month during March 2015! Follow us on social media and be sure to check your email (sign up for our list) for weekly stories on the amphibians of the Garden State and our work to protect them. On the night of March 14, Conserve Wildlife Foundation Communications Coordinator Lindsay McNamara attended the first closure of Beekman Road this season. Beekman Road, in East Brunswick, New Jersey, is closed to traffic about two or three nights for six to twelve hours each spring by Friends of the East Brunswick Environmental Commission (Friends of EBEC). Friends of EBEC organizes these road closures to maintain local biodiversity. In the woods on either side of Beekman Road, vernal pool habitat exists. Vernal pools are temporary woodland ponds that fill with water during the winter and spring and dry out in the summer. These vernal pools are extremely important for a number of amphibians in the area. Spotted salamanders, wood frogs, green frogs, spring peepers, Fowlers toads and chorus frogs all rely on the vernal pools for breeding. Some amphibians, like spotted salamanders and wood frogs are entirely dependent on the vernal pools for breeding. They leave their winter hibernation spots in upland forests and migrate (often in large groups) to the vernal pools. Research suggests that these species follow the same migratory paths each year, often traveling distances of as much as 1,000 feet from their hibernation spots. At the vernal pool, mating occurs, eggs are deposited by the females, and the adults leave the habitat and venture to the surrounding woods. The adults spend their summer in these wooded areas before slowly retreating back to their winter hibernation areas, and the natural cycle begins again. Unfortunately, the migrating amphibians need to cross Beekman Road to get from their hibernating spots to their vernal pool breeding grounds. Road kills during this journey significantly reduce salamander and frog populations and can lead to local extinctions at breeding ponds. Friends of the East Brunswick Environmental Commission has worked together with a number of partners to close Beekman Road to traffic during nights when amphibian migration is extremely likely. These road closures help protect migrating salamanders and frogs as they move across Beekman Road to their breeding vernal pools. Friends of EBEC consider a number of variables before they decided to close the road. 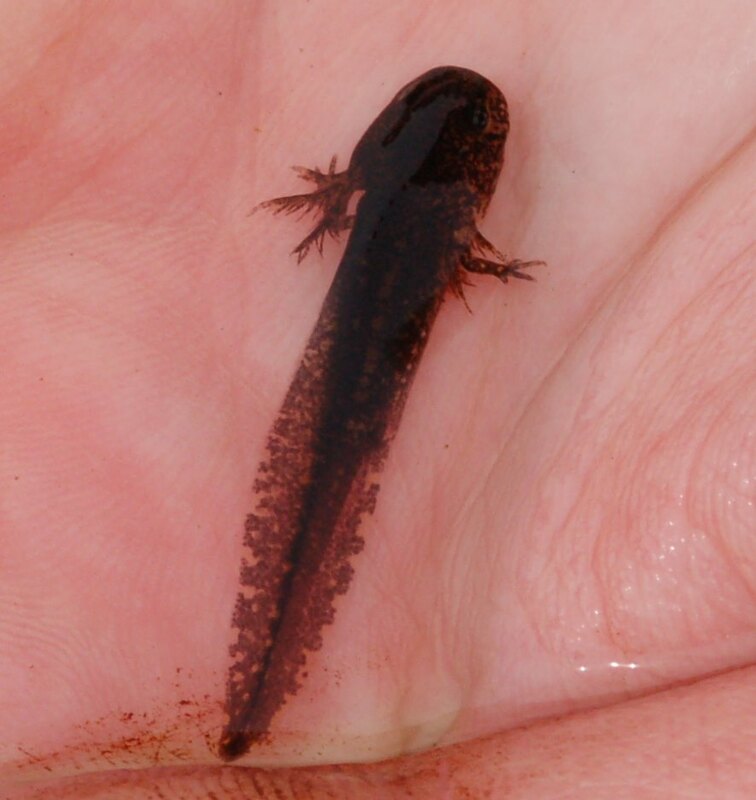 A wide range of factors trigger salamander migration including the amount and timing of rainfall, the date, the temperature of the air, the temperature of the ground, the availability of open water on the vernal pools, the depth the salamanders are migrating, soil moisture and many others. Interestingly, studies have shown that males typically migrate first and arrive at the vernal pools before the females. It seems females need a higher average air temperature to stimulate their movement than the males. Volunteers are encouraged to come on these rainy nights to help the amphibians cross the road. Bring your friends, your family and don’t forget a flashlight, to the next road closure of the season! Updates are posted on the Friends of the East Brunswick Environmental Commission’s blog. These road closures are a great way to protect local biodiversity and educate New Jersey residents about wildlife in their state. 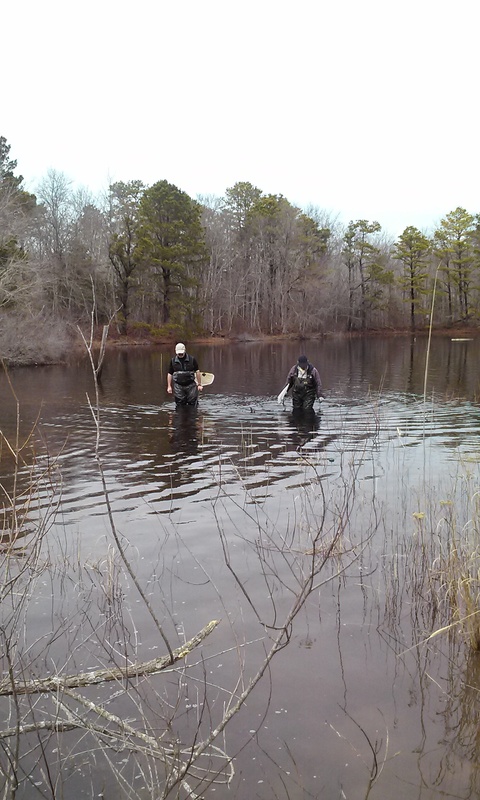 Conserve Wildlife Foundation, in partnership with the New Jersey Division of Fish & Wildlife’s Endangered and Nongame Species Program, lead a number of Amphibian Crossing volunteer programs across New Jersey. Join us! Lindsay McNamara is the Communications Coordinator for Conserve Wildlife Foundation of New Jersey. This week, Conserve Wildlife Foundation, New Jersey Division of Fish & Wildlife Endangered and Nongame Species Program (ENSP), U.S. Fish and Wildlife Service biologists and dedicated trained volunteers surveyed a known Eastern Tiger Salamander breeding vernal pool complex. Tiger Salamanders emerge from their underground burrows in the early winter to breed and lay egg masses in the pools. By March, the adults have returned to their burrows. Biologists and volunteers go out to pools during the winter months to survey for egg masses to determine if the pools are being used by Tiger Salamanders. The cold winter made getting out to pools difficult due to the ice cover, so now that it is warming up we hoped to still be able to find egg masses that hadn’t yet hatched. One hundred sixty egg masses were found in the largest pool, some the of eggs had already hatched but others were still intact. 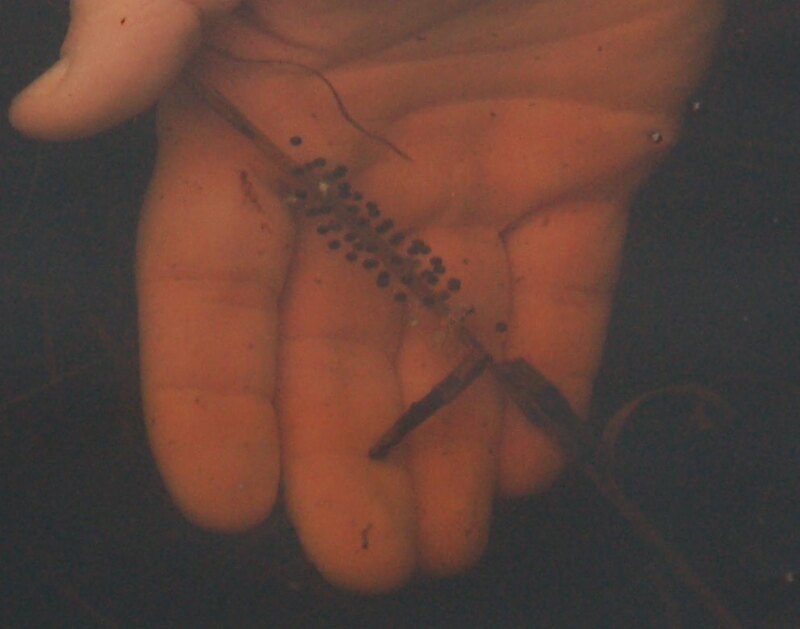 Tiger Salamander larvae was seen along with the larvae of the Marbled Salamander. Vernal pools are breeding grounds for many species which is why it is so important to protect them. In New Jersey, there are only 15 known Tiger Salamander breeding pools in the southern most part of the state. Tiger Salamanders themselves are targeted by collectors for the pet trade which is why their breeding locations are kept a secret. Their habitat is declining due to habitat loss and fragmentation, development, pollution, changes in hydrology, and climate change. Larissa Smith is a Wildlife Biologist and the Volunteer Manager for Conserve Wildlife Foundation of New Jersey.